I'll be interested to see how the Wild plays tonight after the guys, with little to play for tonight, spent yesterday lounging around the pool and golf courses here in the Arizona. The Wild, like 2014 when Ilya Bryzgalov was literally waving at pucks and players didn't get into shooting lanes during a 7-3 home loss to Nashville, could be in do-not-get-hurt mode. The Wild has lost four of its past five (three in a row) season finales and is 6-6-3 all-time in them. The only one this current group won was the one they had to: 2013 at Colorado to clinch a playoff spot -- the first of five berths in a row -- on the final day of the season. Plus, the Coyotes have a lot to play for tonight. This could be Shane Doan's final NHL game and certainly his final game playing for the only organization he has known. Good day from the Desert, where the Wild had a 9 a.m. skate today after yesterday's off-day. Puck drop here is 6 p.m./8 p.m. back in the Central. I'll be on Fox Sports North at 7:30 p.m. and the first intermission. Mikael Granlund, who has played 199 consecutive games, will get the night off. He's a point from becoming the Wild's first 70-point scorer since Mikko Koivu did the feat in 2009-10, but he's so important to the Wild, coach Bruce Boudreau doesn't want to risk his health against the physical Coyotes. Defenseman Jared Spurgeon could also play after missing Thursday's game in Denver with a lower body injury, but he too is so important, Boudreau doesn't want him to aggravate the injury. Boudreau told me yesterday during a sit-down in the hotel here, "I told him, 'You're the only guy I know that could miss a couple games and it’s not going to hurt your timing or anything else. I’d rather have him 100 percent. He’s our key, he’s our guy." Want to know what the Wild thinks of Spurgeon right now? GM Chuck Fletcher told me yesterday during a sit-down (You'll read this quote again in a story I'm writing for Wednesday), "I don't think he gets anywhere near the recognition on a national level that he deserves. He's quietly having an outstanding season, one of the best seasons of any defenseman in the National Hockey League, and he continues to go under the radar, which I know he likes. But his emergence has been amazing the last couple seasons, and now he's right there with Ryan [Suter] in terms of being able to take a big load of minutes." Jordan Schroeder is also scratched. Boudreau was not happy with his game in Denver and they want to get Chris Stewart back into game shape tonight after missing the past two games. Boudreau said the Nino Niederreiter-Eric Staal-Zach Parise has been so good, he wants to play them again so they can continue to develop chemistry. He said Staal and Parise don't want to rest anyway. Staal has a point in nine of his past 10 games. Niederreiter has five goals in five games after none in the previous 16 and hit his career-high 25th last game. Zach Parise is a goal from 20. After 10 years in the desert, 2005 first-round pick Martin Hanzal will face the Coyotes for the first time since being traded Feb. 26. He's excited for the game, got to have lunch with old pals Radim Vrbata and former Wild Zbynek Michalek yesterday and return to his house and gather stuff he left behind. Hanzal has three goals and 12 points in 19 games with the Wild. With a point, the Wild will break its franchise record for points (currently 104). With a win, the Wild will break its franchise record for wins (currently 48). Darcy Kuemper gets the start. Please give it a read because there's some good info in there. As I've reported, you can bet Alex Stalock will be recalled Sunday or Monday for the playoffs. On an aside, as I've told some people on Twitter and email the past few days, can we quit with this false belief by so many fans that holding out for a one-way contract is why he didn't go to Iowa back in 2014? 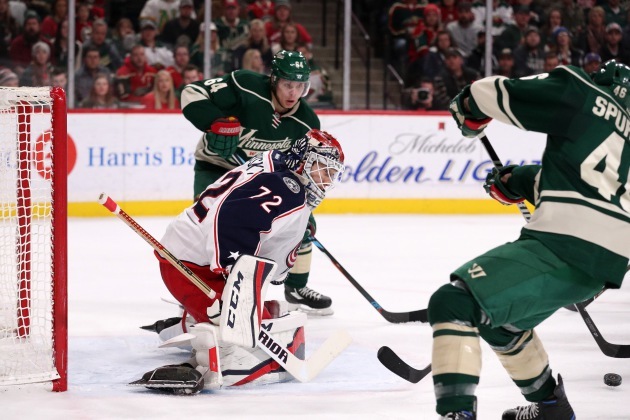 He didn't go to Iowa because Josh Harding broke his foot, Niklas Backstrom was coming off injury and Ilya Bryzgalov was, in an emergency, brought to camp on a tryout. Kuemper was going to start as the No. 1 that season with a one-way or two-way. He started with consecutive shutouts and a 6-2 record, and ultimately he accrued enough games early that season that he required waivers. That would have happened with a one-way or a two-way. It's just a fallacy that Kuemper's contract dispute caused him not to go to Iowa, and again, one-ways and two-ways make no difference with waivers. Heck, Schroeder's on a two-way and he has been put on waivers a gazillion times. That's about it. Arizona has played well lately. Since they started a three-game winning streak on Jan. 21, the Coyotes have more points (38) than any other team (12 of them) that has been eliminated from the playoffs except Winnipeg (39).